Daniel Walbidi Wirnpa 2016–2019 (detail). Sand installation and digital video, dimensions variable. Courtesy the artist and Short Street Gallery. John (Johnny) Nargoodah Life on a muster 2018. Synthetic polymer and leather ink on stamped cow hide, 92 x 199 cm. Courtesy Mangkaja Arts Resource Agency. Sonia Kurarra with her artwork Noonkanbah Highway 2018. Synthetic polymer on cow hide, 140 x 268 cm. Courtesy Mangkaja Arts Resource Agency. 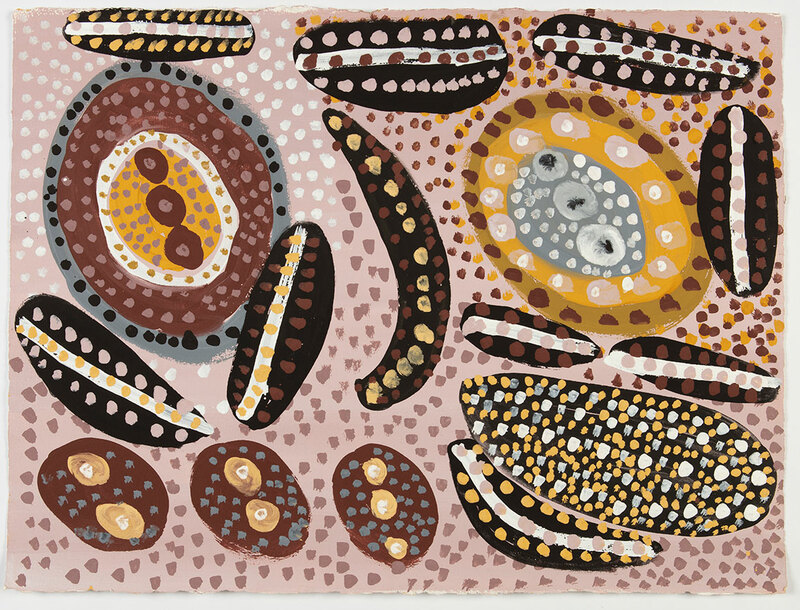 This landmark exhibition celebrates the conclusion of a six-year visual arts research and development project between the Art Gallery of WA and Aboriginal artists and art centres in the Kimberley. At the heart of the exhibition is a group of eight commissions. Made by more than forty artists from six art centres and three independent artists, the commissions present as eight installations that are as diverse as much as they are alike. Each installation represents a different journey toward the same destination of individual and collective cultural expression. Experimental in both intent and form, the installations range from leather cow hides to video and animation, to paintings in sand, ochre and acrylic, to glass works, drawing and photography, as well as small and large-scale geometric designs on pearl shell and steel. These works capture the creativity, imagination and texture of Kimberley art and culture. Join one of our Gallery Guides on a tour that looks closely at works that communicate the artists' ideas about place, Country, identity and belonging. Published in partnership with UWA Publishing, a 240 page publication complements the exhibition and documents the Desert River Sea visual arts project and the artists and art centres of the Kimberley region. Purchase a copy from the Art Gallery Shop. Visit Desert River Sea: Kimberley Art Then and Now for all the details on the project and artists involved. 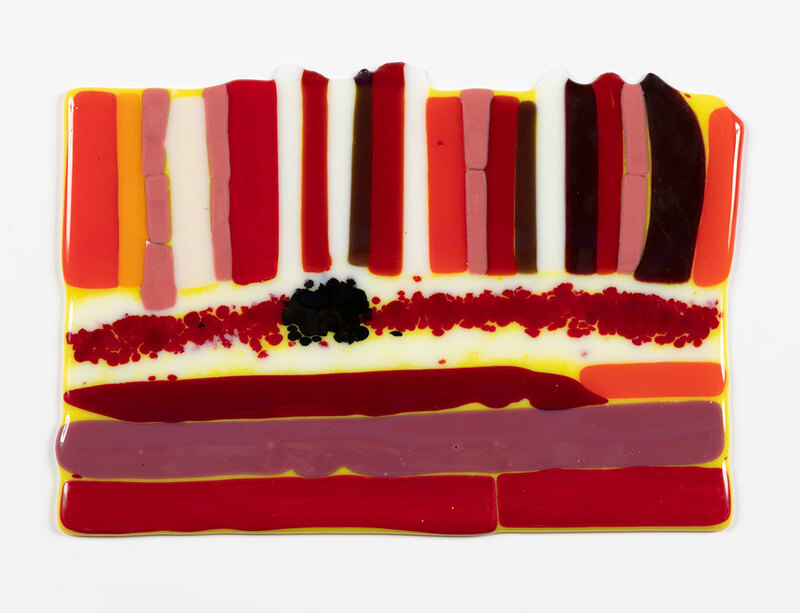 Kiln fired glass, 31.2 x 21.7 cm. Courtesy Warlayirti Artists. Ochre pigments on paper, 57.5 x 76 cm. Courtesy the artist’s family and Kira Kiro Art Centre. Inkjet on Museo Silver rag, four parts, dimensions variable. Courtesy the artist and Mowanjum Aboriginal Art and Culture Centre. Synthetic polymer and leather ink on stamped cow hide, 92 x 199 cm. Courtesy Mangkaja Arts Resource Agency. Synthetic polymer on cow hide, 140 x 268 cm. Courtesy Mangkaja Arts Resource Agency. Desert River Sea: Kimberley Art Then and Now is a ground-breaking six-year visual arts initiative developed by the Art Gallery of Western Australia with funding support from the Rio Tinto Community Investment Fund. 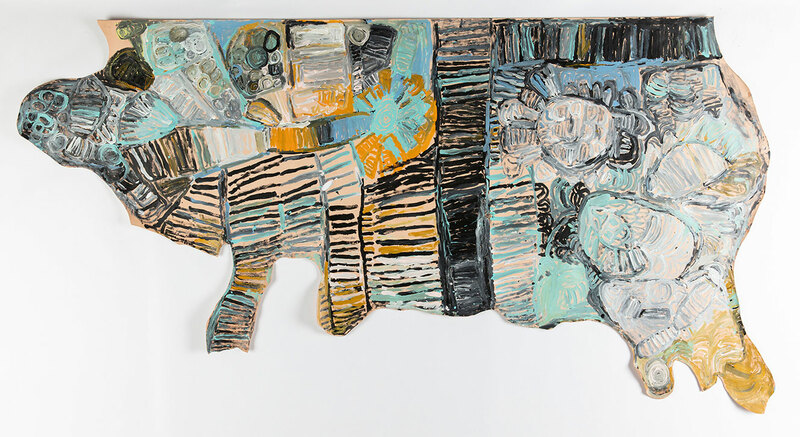 Its aim is to bridge the cultural and geographic distance between Aboriginal artists of the diverse Kimberley region, the Gallery in Perth and national and international audiences, thereby forging a network of cultural and artistic exchange and understanding. Born out of close consultation with senior artists, art centres and community members, the project includes the development of a comprehensive digital portal www.desertriversea.com.au, a Visual Arts Leaders professional development program and research and documentation. It will conclude with a publication and landmark exhibition in 2019 celebrating the region’s art and culture. desertriversea.com.au celebrates the art of the Kimberley region, as well as its diverse cultures, the breathtaking landscapes and narratives which tell of its creation, and the people who call this country home. Over 500 artworks are displayed here. With content updated regularly, this online portal is a compelling resource for all those seeking inspiration from, and information about, Kimberley art. “This exhibition is buzzing with authenticity; it is fresh and considered; it is inclusive and empowering and most importantly, this six year project leaves a legacy that will be felt for years to come."